Home / Industry News / Courage to size doubly rewarded! 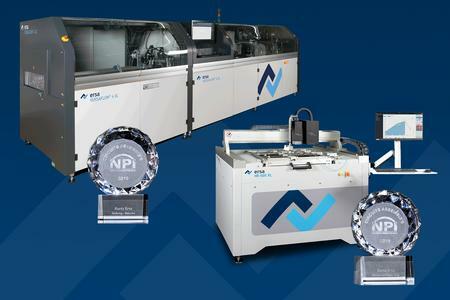 Selective soldering in large format and top quality: NPI Award winner Ersa VERSAFLOW 4 XL. Also awarded the NPI Innovation Prize at APEX in San Diego: The hybrid rework system Ersa HR 600 XL for the high-quality repair of big electronic assemblies up to 625 x 625 mm (24 x 24 inches). As a market leader in selective soldering and a supplier of innovative hybrid rework systems, Ersa had the courage to adapt its soldering machines to the electronic assemblies of the future. The trend in electronics manufacturing is not only towards miniaturization, but also towards large, highly integrated assemblies, for example for control centers or LED lighting technology. This is where the VERSAFLOW 4 XL comes into play, which can solder big boards up to 610 x 1,200 mm (24 x 48 inches) safely and efficiently in top quality. With up to five heating zones and three VERSAFLEX modules (two pots each on two independent axes), the Ersa VERSAFLOW 4 XL has found a firm place in the Ersa product portfolio thanks to its flexible performance – 15 delivered and installed systems within only a few months prove this.